Looking for the perfect gift for Mother's Day? Look no further! We're so excited to announce our first champagne Dinner at Oliver Royale. We invite you to spend a magical evening, enjoying each others company, a relaxing atmosphere and an enchanting dinner. Upon arrival you'll be greeted with a delicious cocktail followed by a five course dinner thoughtfully prepared for you by our Executive Chef Jonathan Gatlin and his team. Throughout dinner, guests will be led by Brand Ambassador, Kim Kallenberg, through a tasting (and a fascinating history) of some of the most interesting champagnes! Not a bubbles connoisseur? No worries, this is a perfect way to learn and get excited about wine. Tickets are $99 per guest, plus tax and gratuity. Total pricing of $127 in purchase price include event dinner, welcome cocktail, five champagne pairings, dessert, tax and gratuity. We truly hope you can join us for this very special event! Tickets are $49 per person. Must be 21 years or older. Purchase price includes event cocktail class/pairings, take home recipes, hors d'oeuvres, tax and gratuity. We hope you can join us for this truly awesome event! It's that time again, time to celebrate America’s native spirit with Oliver Royale! Come immerse yourself in all things bourbon here with the Sazerac family while letting them guide you through these very special [and highly allocated] spirits! Making their debut... Our trio of hand-selected barrels Weller 107, Blanton's and Buffalo Trace! It is sure to be an amazing night featuring food perfectly paired with Bourbon, Rye and Whiskey...not to mention great friends, old and new! The evening will start with a passed welcome libation upon arrival. Once everyone is seated, we will begin the prepared five-course dinner, which Executive Chef Jonathan Gatlin and his culinary team skillfully created! Tickets are $99 per person, plus tax and gratuity. Total pricing of $127 in purchase price includes your five-course event dinner, allocated whiskey pairings, tax and gratuity. We hope you can join us for this truly special event! *Have a special bourbon connoisseur in your life… This would be the PERFECT gift for any occasion!!! We're so excited to announce our Donkey & Goat Wine Dinner at Oliver Royale with wines we love so much; like Gadabout, The Bear and Gigi wines. We invite you to spend a magical evening, enjoying each other’s company, a relaxing atmosphere and an enchanting dinner. Upon arrival you'll be greeted with a delicious cocktail followed by a five-course dinner thoughtfully prepared for you by our Executive Chef Jonathan Gatlin and his team. Throughout dinner, guests will be led by Wine Ambassador, Rich Dixon, through a tasting (and a fascinating story) of some of Donkey & Goats most exciting wines. Not a wine connoisseur? No worries, this is a perfect way to learn and get excited about wine. Tickets are $99 per guest, plus tax and gratuity. Total pricing of $127 in purchase price include event dinner, welcome cocktail, five wine pairings, dessert, tax and gratuity. We truly hope you can join us for this very special event! We're so excited to announce our Taste of Spain Wine Dinner at Oliver Royale with Aurelio Cabestrero of Grapes of Spain! We invite you to spend an evening, enjoying each others company, a relaxing atmosphere and an enchanting dinner. Upon arrival you'll be greeted with a cava based cocktail followed by a five course dinner prepared for you by our Executive Chef Jonathan Gatlin and his team. Throughout dinner, guests will be led through a tasting (and a fascinating history) of some of Spain’s most interesting wines, stretching across various regions and including popular varietals like Cava, Albariño and Tempranillo. Not a wine connoisseur? No worries, this is a perfect way to learn and get excited about wine. Tickets are $79 per guest, plus tax and gratuity. Total pricing of $102 in purchase price include event dinner, welcome cocktail, five wine pairings, dessert, tax and gratuity. We truly hope you can join us for this very special event! Join us for our Valentine's Day Dinner filled with an amazing four-course dinner thoughtfully created for you by our Executive Chef, Jon Gatlin for $79 per guest. Reservations can be made online or by calling our restaurant directly at 865-622-6434. Dinner reservation times are available 4pm-10pm. 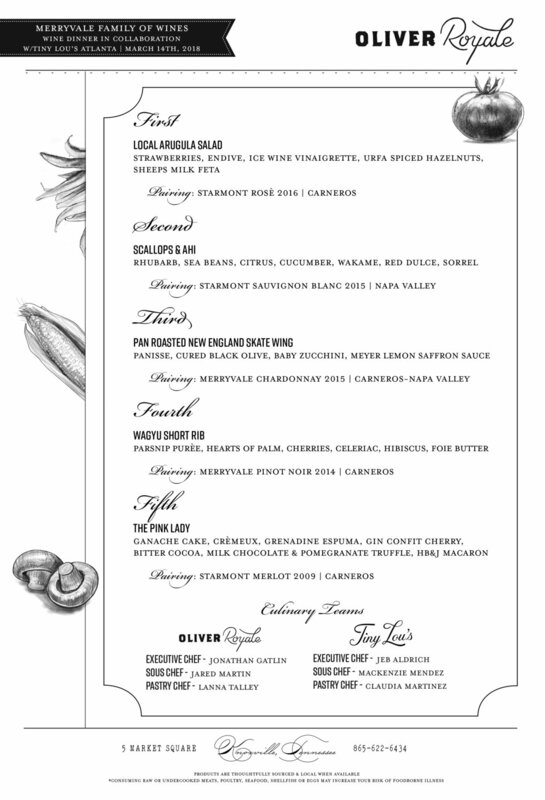 We’re celebrating Valentine’s Day a day early at Oliver Royale with a special evening with Orin Swift Cellars. The evening will consist of a passed greeting libation upon arrival followed by a four-course curated dinner thoughtfully prepared for you by our Executive Chef, Jonathan Gatlin, and his team. Throughout the dinner guests will be led through fascinating history as they sample their incredible wines. Not a wine connoisseur? No worries! This is a perfect opportunity to learn, taste, and savor wines featured. Tickets are $99 per person, plus tax and gratuity for a total price of $127. In purchase price includes event dinner, wine pairings, dessert, take home gift, tax and gratuity. We look forward to sharing a night of fun and romance at our special Valentines Day event! Join us for our delicious New Year's Day brunch, offered 10am-3pm. Join us for our 4th annual New Year's Eve celebration filled with an amazing four-course dinner thoughtfully created for you by our Executive Chef, Jon Gatlin, and a complimentary champagne toast for $99 per guest. Reservations can be made by calling our restaurant directly at 865-622-6434 or emailing Sondra@theoliverhotel.com. Dinner reservation times are available 4pm-10pm. Join us on Christmas Day anytime from 11am-8pm an enjoy a festive three-course menu thoughtfully prepared by our Executive Chef Jonathan Gatlin. Menu price is $49. Reservations are recommended, but walk-ins are always welcome and accommodated based on availability. December is upon us and that means it’s time to taste some BIG wines and kick hunger to the curb! Oliver Royale is very excited to announce our upcoming wine dinner with Orin Swift Cellars, who has partnered with Kick Hunger & Second Harvest Food Bank in which proceeds will directly donate meals to local families in need. Let’s kick off the holiday season sipping some incredible wines and giving back to a great cause! We invite you to spend a magical evening enjoying each other’s company in a relaxing atmosphere and enjoying an enchanting dinner! Orin Swift Wine Ambassador David Bohannon will take you through the portfolio that David Swift Phinney has so masterfully created. Upon arrival you'll be greeted with a delicious cocktail followed by a five-course dinner thoughtfully prepared for you by our Executive Chef Jonathan Gatlin and his culinary team. This event alone is estimated to donate an extra 200+ meals within our local community! Tickets are $115 per guest, plus tax and gratuity. Total pricing of $148.63 in purchase price includes event dinner, welcome cocktail, five wine pairings, dessert, tax and gratuity. We look forward to sharing this magical evening with you! Join us this Thanksgiving anytime from 12noon-8pm for a beautiful three-course menu thoughtfully created for you by our Executive Chef Jonathan Gatlin. Menu price is $49. Reservations are recommended, but walk-ins are always welcome and accommodated based on availability. Come celebrate our 3 year anniversary with us! It’s been such an amazing journey so far and we’re so excited to see what the future holds! Come enjoy a complimentary glass of champagne on us anytime from 11am-10pm as our way of saying thank you! We’re so blessed to have the BEST guests in the world! We're so excited to announce our Love & Exile Wine Dinner at Oliver Royale. We invite you to spend a magical evening, enjoying each other’s company, a relaxing atmosphere and an enchanting dinner. Upon arrival you'll be greeted with a delicious cocktail followed by a five-course dinner thoughtfully prepared for you by our Executive Chef Jonathan Gatlin and his team. Throughout dinner, guests will be led by their Owner & Winemaker, Tyler Alkins, through a tasting (and a fascinating story) of some of Love & Exile’s most exciting wines. Love and Exile Wines was founded on the simple premise that wine should be approachable, affordable, fun and easy. Housed within minutes of downtown Nashville, they are a true urban winery, sourcing grapes from the best wine regions from around the world and distributing throughout the Southeast. Never ones to take themselves too seriously, Love and Exile Wines promise to live up to their name, as The Good Time Wine Company. We're so excited to welcome the newest member of the Oliver family, Tiny Lou's, located in Atlanta, Ga! Tiny Lou's, housed in our beautiful new property, The Clermont Hotel, is set to open next month. Be the first to try the handiwork of their Executive Chef, Jeb Aldrich, right here at Oliver Royale! Join us for a very special evening as Oliver Royale's Executive Chef, Jon Gatlin, works in collaboration with the Tiny Lou's culinary team, to bring you the Merryvale wine dinner! This beautiful five course dinner is thoughtfully paired with the very best that the Merryvale Family of Wines has to offer. Throughout dinner, Josh Brett, Brand Ambassador to Merryvale Family, will lead you through a tasting and the fascinating history of the family's most interesting wines. Not a wine connoisseur? No worries, this is a perfect way to learn and get excited about wine! Tickets are $79 per guest, plus tax and gratuity. Total pricing of $102 in purchase price include event dinner, welcome cocktail, five wine pairings, dessert, take home gift, tax and gratuity. We truly hope you can join us for this very special event! 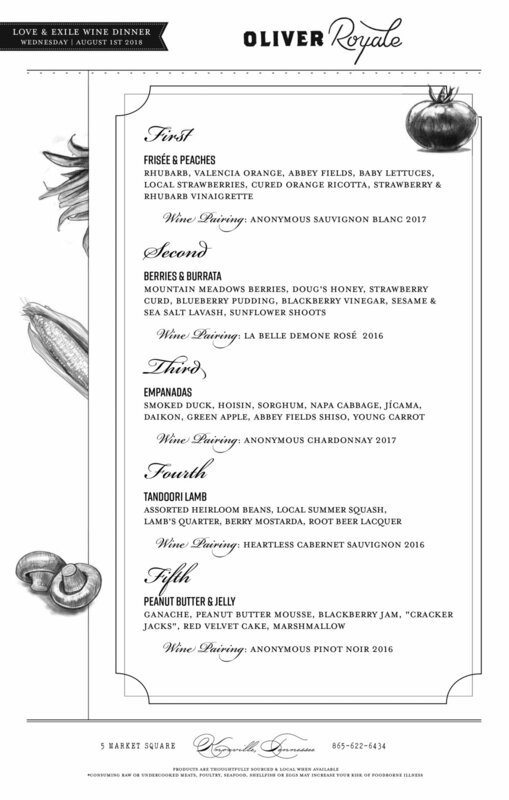 We're so excited to announce our first ever Bell Cellars Wine Dinner at Oliver Royale. We invite you to spend a magical evening, enjoying each others company, a relaxing atmosphere and an enchanting dinner. Upon arrival you'll be greeted with a delicious cocktail followed by a five course dinner prepared for you by our Executive Chef Jonathan Gatlin and his team. Throughout dinner, guests will be led through a tasting (and a fascinating history) of some of Anthony Bell’s most interesting wines, stretching across various regions and including popular varietals. Not a wine connoisseur? No worries, this is a perfect way to learn and get excited about wine. Tickets are $95 per guest, plus tax and gratuity. Total pricing of $122 in purchase price include event dinner, welcome cocktail, five wine pairings, dessert, take home gift, tax and gratuity. We truly hope you can join us for this very special event!